Yep, that whole bowl of veggies is going right into the potato salad! We flavored our sweet potato salad with green pepper, jalapeno, celery, red onion, garlic, cumin, chili powder and lots of fresh cilantro! You know by now we aren't going to use mayonnaise to tie this together! We whipped up quick dressing made from only orange juice, olive oil and freshly squeezed lime juice! Hope you enjoy our healthy spin on the traditional potato salad! 1. Add chopped sweet potatoes to small pot of boiling water. Boil potatoes for approx. 20 minutes or until soft and tender. 2. Drain potatoes and add to mixing bowl. 3. 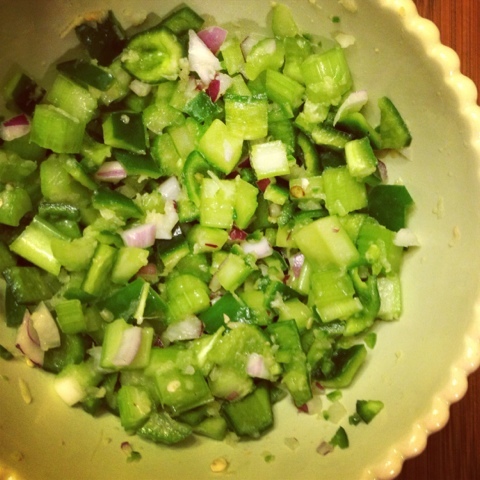 Add pepper, jalapeno, red onion, garlic, cumin, chili powder and fresh cilantro to bowl. Mix to combine flavors. 4. To make dressing - whip orange juice, olive oil and the juice from lime. Pour dressing over potato salad and stir to coat all potatoes. 5. Chill potato salad in the fridge for as long as you can! The longer it sits the better! 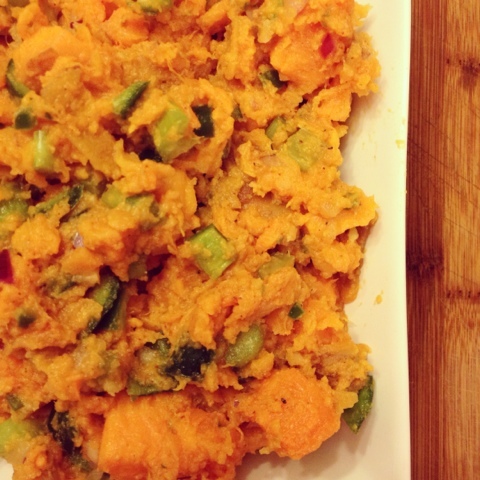 This Spicy Sweet Potato Salad looks so delicious! Thanks for linking up at The Weekend re-Treat Link Party on The Best Blog Recipes! Pinned to my Link Party Recipe board while I was here tonight too! This salad looks amazing and I just checked - I have everything to make it! New Follower here and love what I see on your blog! This looks really good! By the way, I really like your blog(: The blog hops are so much fun! I found you through one of those! Thanks for sharing!